Marbles is ‘open-source’ improv; a free-and-easy solo format where anything can happen. It usually involves chats with the audience, sometimes guest players (from seasoned veterans to innocent audience members), and always features Ryan riffing on it all through improvised stories, scenarios and characters. 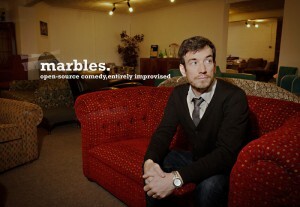 Originally developed by Ryan Millar and Dave Waller as a two-man format, Marbles has always been a very open show. Based on chats with the audience, and riffs on whatever springs to mind, improv would happen, and themes and stories would emerge. Ryan first attempted it on his own once when Dave was double-booked in spring 2012. That went really well. So did the next time. When Dave quit Marbles that summer to focus on his own projects, Ryan decided he enjoyed doing Marbles on his own so much that he continues to do so. 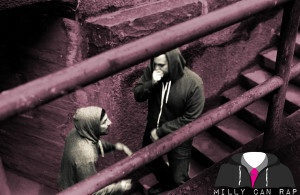 What happens when two improvisers who both love hip-hop get together to do a two-person show? I’ll tell you: Milly Can Rap. That’s what. I invited Trent Pancy (Finland International Improv Festival, JadaJada Improv) to Brussels in December 2013 to teach workshops and do some shows with me. We didn’t just do shows though, we created a brand new format and a brand new group. It involves interconnected scenes, beatboxing and rapping. It’s called Milly Can Rap and it is ridiculously fresh. Since then we’ve performed in Amsterdam, Tampere and Helsinki, and will be part of the Barcelona International Festival in November 2014. The Mullet is not for pussies. One man creates a feature film, for your eyes only. Every performance is an opportunity for Ryan to develop and pitch a one-off idea to an audience with the power to greenlight his dreams. Every show is a different film. With the audience as focus group, writers’ room, co-stars and studio executives, Ryan creates all the elements of the perfect action-packed Hollywood blockbuster. Or romantic comedy. Or heart-warming coming-of-age tale. Or whatever film it is the audience decides it wants to see. You get the point. But the question is: does he get the picture? 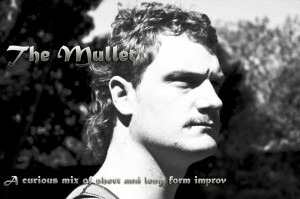 Ryan is available for workshops, coaching and drop-in shows, because he just can’t ever get enough improv in his life. 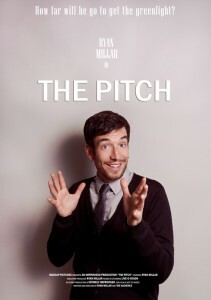 Ryan is an improviser, writer, communications trainer, storyteller and comedian living in Amsterdam. He has nearly twenty years experience teaching, training and entertaining, working in different countries and languages. Performing scripted and unscripted material, as well as hosting shows and events.